If you didn't go to the Thursday night preview screenings of Spider-Man: Homecoming last night, there will be SPOILERS below, so read on at your own risk. Among the hot topic of fans leaving Spider-Man: Homecoming Thursday previews was the rather surprising ending, which could easily take the franchise in exciting new directions. Now Marvel Studios president Kevin Feige opened up about why that ending was chosen, revealing it is something he has wanted to put on film for several years. This is your last chance to avoid SPOILERS, so stop reading now if you haven't seen Spider-Man: Homecoming yet. We've known for many months, through trailers and other footage, that Peter Parker's (Tom Holland) best friend Ned Leeds (Jacob Batalon) finds out early on that Peter is in fact the Spider-Man, giving Peter someone to share this massive secret with. The movie's final scene reveals that, after spending the whole movie hiding his Spidey ways, his Aunt May (Marisa Tomei) does find out he's Spider-Man, standing in his bedroom's open doorway while he's still wearing the costume, as she screams "What the f-" as the end credits begin. Cinema Blend caught up with Kevin Feige, who was asked about why that particular scene was put in place. As it turns out, Kevin Feige has wanted to use a scene like this going all the way back to Spider-Man 2, based on an old Spider-Man comic by J. Michael Straczynski. "J. Michael Straczynski did an issue when he was doing his run of Spidey many years ago where she discovered the secret. I think it was in the laundry or something, and they had a sit-down scene. And probably going back to Spider-Man 2, I would sort of carry that issue around and go, 'We should do this someday, we should do this someday.' And it was great luck that it hadn't been done yet. That was always part of the plan. And very much like our instinct to say, 'Let's have Tony Stark say I'm Iron Man at the end.' Well, what does that mean for the next movie? I don't know, but it will force us to do something unique. We did not want to do the secret identity thing at that point in the MCU. And now, same thing. The dynamic now is forced to be something fresh and something unique going forward." Marisa Tomei was first introduced as Aunt May during last year's Captain America: Civil War, where Tony Stark surprisingly stopped by May and Peter's Queens home to recruit him to fight for Team Iron Man. Marvel and Sony have since confirmed that Spider-Man: Homecoming 2 will hit theaters on July 5, 2019, and while no specific cast members have been confirmed, the final scene most certainly hints that Aunt May will be back alongside her superhero nephew Peter Parker. Marisa Tomei revealed that the final scene was already in place when she first got a hold of the script, revealing that this will open up a different kind of relationship between Peter an May. "By the time [the script] got to me, that scene was already in place. And it was a set up for whatever is to come. It takes a big burden off of the character, too. You don't have to do the same thing over and over again, so he and I can have a different kind of relationship going forward, also. That will come in the next installation, if I'm lucky and it happens. But I think it will. I hope. I think that will free up having the same kind of, 'I wonder what he's doing? He looks suspicious!' There are only so many ways I can skin that cat." Tom Holland recently confirmed that there will be a new Spider-Man trilogy, with each movie believed to take place during one year of his high school career, since Spider-Man: Homecoming takes place during Peter's sophomore year. 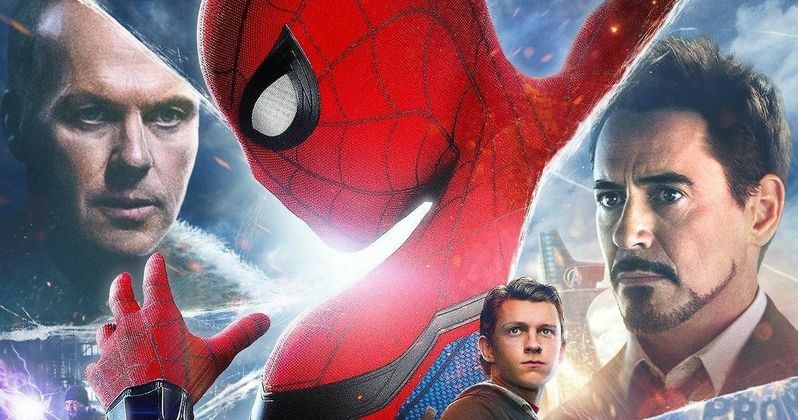 Director Jon Watts, who also co-wrote the script with John Francis Daley, Johnathan Goldstein, Christopher Ford, Erik Sommers and Chris McKenna, revealed that once that scene came up, they knew they had to find a way to make it work in the movie. Here's what the director had to say below. "The goal behind this movie is to just come up with moments and things that people have never seen before, and people can't believe that just happened. And that was one where, as soon as the idea came up, it was like, 'Oh yeah, we gotta do that.' ... It's definitely a thing where, well, now we have to figure that out!" Now that Peter has two people he's close to who know his secret, Aunt May and Ned Leeds, he'll likely feel much less of a burden with this double life, although he'll still surely still have to keep his superhero identity a secret from his classmates like Flash Thompson (Tony Revolori) and Michelle (Zendaya). It isn't even known who is coming back to write the script for Spider-Man: Homecoming 2 yet, or if Jon Watts will return to direct. Be sure to check back throughout the weekend to see how Spider-Man: Homecoming fares at the box office.